This programme gave me the chance to meet the most talented, professional, powerful and inspirational leader. She taught me everything she considered important, shared points of view, new ideas and valuable advice. In fact, I believe that Leaders-for-a-Day is a really innovative and interesting programme that brings so much added value to students such as myself, who are taking their first steps into the world of business management and leadership as it presents a practical opportunity to develop those skills in an environment that is a step ahead of traditional teaching environment. Moreover, I am very grateful to Junior Achievement for this unique opportunity. I will keep in mind everything I learnt with Elke during this day in order to become a good leader in the future! 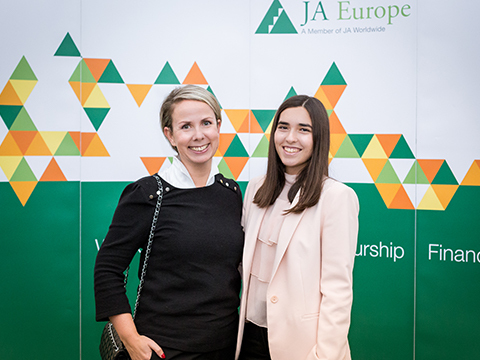 Finally, I would also like to thank all the JA Team and organization, who made everything at their reach to make us feel at home!